Medical equipment: radiology, lab, patient beds, etc. Medical supplies meeting most of your clinical needs: exam gloves, needles, syringes, bandages, dressings, and much more. Premier offers a national and regional distribution program so your agency quickly and effectively receives needed products. Access Premier and OMNIA Partners’ primary distributor, McKesson and featured partner, Medline Industries. You are not limited to this primary distributor and can access additional distributors with Premier agreements. Distributors work with manufacturers with Premier agreements so your agency receives the best pricing. Your current distributors may have a Premier agreement. Even if you buy the same items from the same distributors, you may save. Request a market basket to see the comparison. Medical and Surgical Products Distribution Henry Schein, Inc.
Morris & Dickson Co., Ltd.
Premier offers over 1,390 agreements and 100,000 products. To find out the pricing your agency can receive, request a market basket. What is a market basket? It’s an analysis of your top medical purchases. Premier will match up your items with items available on the Premier agreement showing you the savings. This is the most efficient way to demonstrate how the program will meet your needs. Once you have become a member, you will have the option to look at more than 1,390 agreements. Once the online form is completed, the Premier team will follow-up and walk you through the exact product level purchased information that is needed to provide a market basket that shows your customized pricing. Don’t need to compare pricing? Interested in the program? Enroll now. Become a part of the Premier community and start saving. A Malcolm Baldridge and Ethisphere award winner, Premier is an advocate for OMNIA Partners participants. Premier offers a wide selection of products, equipment and solutions to meet your clinical needs. Pricing reduces goods and services costs for you. Agreements are competitively bid every three years. A membership committee evaluates and awards these agreements. The committee includes Premier members from pharmacy, supply chain, nursing and other healthcare staff. Premier Safety Institute®: The Premier Safety Institute provides resources about emerging safety concerns (like Ebola). Action for Better Healthcare: Action for Better Healthcare, a blog from Premier, Inc., is the go-to source for healthcare insights and trends. Annual Breakthroughs Conference and Exhibition: Annual national performance improvement conference, drawing more than 4,000 attendees from Premier’s member hospitals and suppliers. Advisor Live® webinar series: Interactive webinars on a variety of hot topics. Monthly member educational webcasts: Complimentary webcasts offer an interactive opportunity for knowledge advancement. Pharmacy communication platform: Premier hosts pharmacy webinars for Premier members to create a forum for knowledge-sharing related to innovative practices that will safeguard patient care and minimize resource consumption. Premier is a group purchasing organization helping members achieve cost savings and efficiencies. 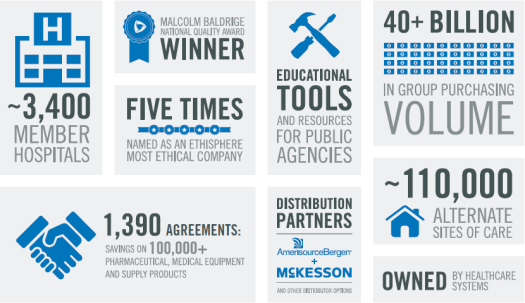 A Malcolm Baldridge and Ethisphere award winner, Premier is an advocate for OMNIA Partners participants. Premier leverages member volume to help you save on goods and services. Premier offers a wide selection of products, equipment and solutions to meet all clinical needs. Premier is one of the largest and most successful group purchasing organizations today. What is the relationship between Innovatix and Premier? Innovatix is a wholly-owned subsidiary of Premier. Innovatix was founded in 1993 as a group purchasing organization (GPO) that serves pharmacies, senior living providers, and independent oncology practices. Premier acquired Innovatix (as well as its sibling GPO, Essensa) in 2016. The Innovatix team often works directly with public agencies and government entities participating in the Premier program. A GPO (Group Purchasing Organization) is an organization that assists their members in realizing savings and efficiencies. GPOs aggregate purchasing volume and negotiate discounts. GPOs do not purchase or buy any products. They negotiate agreements with manufacturers, distributors and suppliers on behalf of their membership. Can a public agency join a GPO? Yes, any public agency can participate in a group purchasing organization. However, they are responsible for compliance with federal, state, and local laws and regulations. This includes open, fair and competitive procurement (informal or formal) of GPO services. What is the Premier Pharmaceutical, Medical Equipment, Supply and Distribution Program? What are the principal advantages of the program? What categories are included in the program? Is there a fee to join or use your service? There is no fee to join the program. Participation is voluntary. Purchase the items you need using pre-negotiated, contracted pricing. How do I see Premier pricing? If you need to compare pricing, Premier offers a market basket analysis. This is the simplest way to determine if the program is correct for your organization. Don’t need to compare pricing and ready to enroll? To purchase, registration is required with OMNIA Partners. Registration is fast, easy and free. There are no fees or commitments to join. CLICK HERE to register. Once registered, go to www.premierinc.com/healthcare-uscommunities. Select JOIN NOW, complete and submit the online registration form. A Premier representative will contact you once your registration has been finalized. You will receive assistance with account set up to include connecting to one of our distributors. More information, call 877.981.3312 or email uscommunities@premierinc.com. Are there reporting tools available? Yes, Premier has numerous reporting tools on their supplier agreement site. Participants can see purchases by specific location or roll purchases into one master account if there are multiple locations. This information can be in total, by manufacturer or by products. How would this program be different from one a participating member might be using today? This program is a single source supplier vs. multiple distributors awarded by line item bids. A prime vendor type relationship reduces ordering time, invoice processing and number of deliveries to facilities. This helps increase overall productivity and efficiencies, operational performance and savings. Who are the distributors with Premier agreements? Premier offers a national and regional distribution program. Participants have access to distributors with Premier agreements, learn more under Shipping & Distribution. What are Contracted Manufacturer Agreements (CMAs)? Contracted Manufacturer Agreements (CMA) are agreements that Premier has negotiated with medical and pharmacy supply and equipment manufacturers through a competitive bid process to provide savings to our members. Most are three year agreements, which allows a balance of price protection and terms with flexibility to respond to changes in the market. Premier has more than 1390 Contracted Manufacturer Agreements for your use covering everything from gauze dressing to MRI’s. This is the core of the Premier program leveraging the overall volume of over $40 billion dollars of contracted purchase on behalf of our members. Premier uses a formal bidding process with awards decided by our member committees. Committees are comprised of subject matter experts who utilize their knowledge to guide sound decisions for our members. Premier provides more than 1,390 contracted manufacturer agreements for products and services. Supplies are sold directly to you or through distributors. Distribution needs will vary. And there’s no fixed price for all. Pay for what you need. These agreements are negotiated to maximize the benefits for all members. They are managed with careful oversight and price monitoring at all times. Agreements are negotiated to determine cost into distribution. They have various controls built in to protect against extreme market fluctuations. Want to know if this program for you? Want to see tailored pricing? Learn More about the Market Basket process. Once the online form is completed, we’ll follow-up and walk you through the exact product level purchased information that we will need in order to provide a market basket that shows your customized pricing. NARCAN® Nasal Spray, is the only FDA-approved, ready-to-use nasal spray version of naloxone hydrochloride. This medication is used along with emergency medical treatment to reverse the life-threatening effects of opiate (narcotic) overdose. NARCAN Nasal Spray, a ready-to-use, needle-free device, delivers a 4 mg dose of naloxone in a single 0.1 ml nasal spray. NARCAN Nasal Spray requires no assembly or priming prior to use. NARCAN Nasal Spray is available directly through Adapt Pharma through the Premier, Inc. contract at public interest pricing. Pricing: This discounted program is an effort to provide affordable access to NARCAN for entities that serve the public interest with limited funding. Public interest pricing at a 40% discount, or $37.50 per dose ($75 for a 2 pack carton)*. Next Steps: OMNIA Partners participating agencies must sign participation documents for Premier’s Medical Surgical and Pharmaceutical Group Purchasing Program. For new orders, register through NARCANDirect. In the contract field, you must include OMNIA Partners. Discounted Drug Program: NARCAN is just one product in a comprehensive program to reduce the costs of medical products used by participating agencies. Contact Premier for additional information on other products or visit the Naloxone or Viekira Pak details. The Premier Flu Vaccine Pre-Booking Program—one of the most comprehensive influenza vaccine product portfolios of any group purchasing organization—is now available to U.S. Communities' participating agencies! Through our designated distributor, FFF Enterprises, you'll enjoy favorable pricing and payments terms, as well as rebates from the nation's leading manufacturers. Make sure you plan in advance and pre-book today! Request more information from Premier or have someone contact you. Requested delivery date and order confirmation at the time of order - Plan flu clinics in advance with confidence! Know when you place your order exactly how much you will receive and exactly when! One stop shopping accommodates ages 6 months and above - Access to 14 vaccine presentations applicable to several age ranges and other considerations, such as thimerosal content, through a single source. Delivery - Shipment dates starting as early as August and continuing through October-simply select the delivery dates of your choice! Price Guarantee - FFF's policy is to NEVER raise prices regardless of market conditions. No deposit and excellent payment terms - Make payment upon receipt of the invoice with 0.25% 20 days, net 60-day terms. Returns - Up to 30% of doses, per presentation type, are eligible for return for Seqirus, GlaxoSmithKline, and Sanofi Pasteur. Premier offers over 1,390 agreements and more than 100,000 products. To find out the pricing your agency can receive, request a market basket. What is a market basket? It’s an analysis of your top medical purchases. We will match up your items with items available on the Premier agreement showing you the savings. This is the most efficient way to demonstrate how the program will meet your needs. Once you have become a Premier member, you will have the option to look at more than 1,390 agreements. Med/Surg product pricing analysis on items in the top 80% of your medical/surgical spend. The standard analysis will include Premier’s price for exact matched items as well as functional equivalents and functional alternatives where exacts are not available. Pharmacy product pricing analysis on items in the top 80% of your pharmacy spend or top 100-150 items. The standard analysis will include Premier’s Price for Exact Matches unless significant savings are available for lower cost Functional Equivalents. The specific data requested is detailed below for each type of analysis. All data should be submitted electronically (email / CD / etc). The preferred format is a Microsoft Excel spreadsheet. Please be sure to include field headers in each file. Adherence to the field order below is suggested but not required. Selected items/products that make up the top 80% of your med/surg spend for the most recent 12 month period if possible. The selected items should be products which are most important to you; our experience suggestions that this is usually no more than 100 - 150 items. Please be aware that if custom products are included, we may not be able to accurately match or provide pricing unless the component list of each product is also submitted. Should you not have access to this information your medical/surgical distributor can supply a report of your past 12 month’s purchases. This is frequently called a velocity or usage report and it can be supplied in an Excel format. If you use their online order entry tools you can frequently download this report yourself in an Excel format. If their format does not match the template below, don’t worry, send it to us and we can determine if you have the correct data to perform the analysis. Indicate the date range of each file (i.e. 03/01/2013-2/28/2014) so that we may annualize it if necessary. A suggested data submission template has been provided, however, if a standard/existing facility report (in an Excel format) is available that minimally includes the fields below, feel free to submit an existing report. Items in the top 80% of your pharmacy spend or top 100 GPO contracted items for the most recent 12 month period. Exclude any 340B items (if applicable) purchased in 12 month period that appear in the data submitted. 340B pricing is controlled by the Federal Government and GPO pricing will not have an impact. Indicate the date range of each file (e.g. 03/01/07-2/29/08) so that we may annualize it if necessary. Provide the Wholesaler Margin % if applicable. The best option is to submit a wholesaler 80/20 report which is available from your pharmacy distributor (wholesaler). However, data may be submitted following the template provided or if a standard/existing facility report is available that minimally includes the fields below, feel free to submit an existing file. What is a Market Basket and Why Do I need to Participate in It?